The phrase "wine on the lake" might have a few different connotations to different people, but come February, it only means one thing: the biggest, vino-iest takeover Erie's bayfront has ever seen. The annual event, which provides a nice break from both the dreary, typically freezing days of February and the long wait until the WineFest (i.e., the North East Wine Country Harvest Festival) in September, has grown to epic proportions, with 34 wineries, over 30 different vendors, live music, shuttle service from Warren, Pa. and an exclusive VIP tasting room, plus a "wine check," where you can leave your purchased bottles in safe hands until you're ready to leave. To maximize attendance, Wine on the Lake will hold its customary two sessions, one in the afternoon and one in the evening. 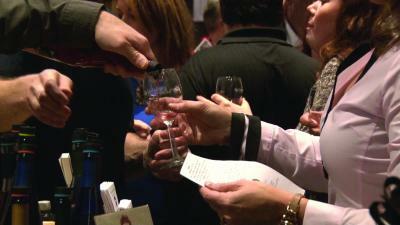 The ticket price includes the souvenir glass and wine samples, plus access to shopping and live entertainment. Among the 34 wineries present, which includes local favorites like 6 Mile Cellars, Mazza Vineyards, and Yori Wine Cellars, there are six new participants: Bear Creek Wines, Bushy Run Winery, Copper Fox Winery, Naylor Wine Cellars, Renegade Winery, and Scheid Family Wines. Vendors on hand will proffer goods and services, but perhaps best of all to go with your wine will be chocolate, from Buckeye Chocolates, a family-owned company out of Ohio named after the beloved chocolate-and-peanut-butter confection; and from Finney's Chocolate Shoppe, a local favorite out of Cambridge Springs with their peanut butter cups, fudge, and bacon bark (chocolate-covered bacon heaven).